-- but we think you'll agree it's a high note for us! it can no longer abide its chains. 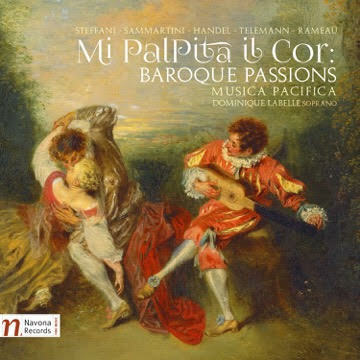 Mi Palpita Il Cor (I Feel My Heart Beating) features the captivating and vibrant voice of award-winning soprano Dominique Labelle. Each of the vocal works on this new album covers a different aspect of love, from anguish to humor. The instrumental pieces are equally full of emotional intensity and passion. We also feature more ways to listen than ever before! Can't get enough virtuosic vocals? We have a wonderful new program we'll be performing throughout November! "Chiesa and Camera" — Virtuoso Vocal and Instrumental Chamber Music from Italy 1650–1700 with Ryland Angel, countertenor. Grammy-nominated countertenor Ryland Angel joins Musica Pacifica in a stunning program highlighting the connections between the sacred and the secular during the Italian Middle Baroque. The program features appealing sacred motets of Alessandro Scarlatti and Alessandro Stradella, as well as complementary instrumental works by these composers and their contemporaries. Check the sidebar on the right for performance dates near you! Thursday, Nov. 10, 2016, 1:30 PM. Music at Oakmont, Berger Center, Oakmont Drive, Santa Rosa, CA. Tickets available for Oakmont residents and their invited guests only. Friday, Nov. 11, 2016, 8:00 PM. San Francisco Early Music Society at First Presbyterian Church, 1140 Cowper Street at Lincoln, Palo Alto, CA. Click here for tickets! Saturday, Nov. 12, 2016, 7:30 PM. San Francisco Early Music Society at St. John’s Presbyterian Church, 2727 College Ave at Garber, Berkeley, CA. Click here for tickets! Sunday, Nov. 13, 2016, 4:00 PM. San Francisco Early Music Society at St. Mark’s Lutheran Church, 1111 O’Farrell at Gough, San Francisco, CA. Click here for tickets! And a rare Texas performance of our beloved annual holiday program! Please forward to your friends and family in the Lone Star State! Frost and Fire. Baroque violinist and fiddler David Greenberg joins Musica Pacifica for an energetic holiday program of 18th-century Scottish Baroque music. Friday, Dec. 9, 2016, 7:30 PM. Houston Early Music at Christ Church Cathedral, 1117 Texas Avenue, Houston, TX. Click here for tickets! As you can see, even though it's only October, the holidays are already very much on our minds! Are they on yours too now? We'd like to make your holidays a little bit easier by helping you get one task out of the way: your year-end donations! Your generous donations help us keep the music coming, and develop educational programs that keep the arts alive. from your friends at Musica Pacifica. Copyright © 2016 Musica Pacifica, All rights reserved.